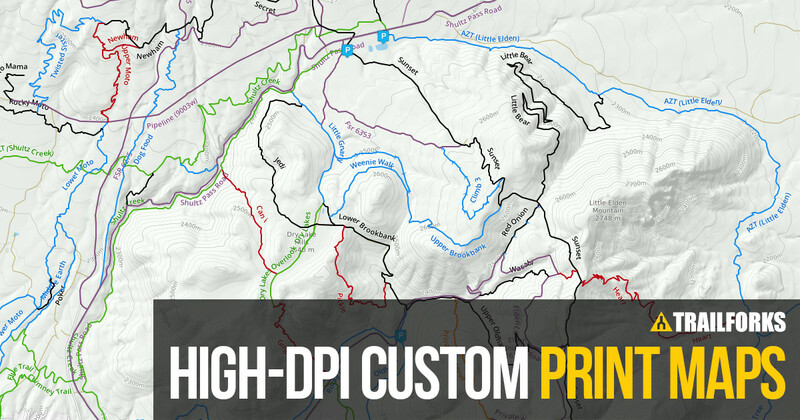 This is an advanced tool for trail associations, race organizers & map makers to generate high resolution printable exports of the Trailforks map data. This tool has a variety of options to assist in generating a map image of your requirements. Such as selecting your print paper size, DPI & format. Maps can be exported in raster formats such as PNG and as VECTOR data in PDF format. Which can then be opened in a program like Adobe Illustrator for further editing by a graphic designer. The map images generated from this tool are not intended to be the final product. But act as the base for creating your own custom map print-outs, sign boards or web graphics. Generating these on-demand maps requires a lot of server processing, depending on your settings it could take minutes to generate and produce a large file download size. Because of this we limit what options a user has access to export. If you require very large dimensions for large sign boards, contact us and we can do a manual export with your specs. This tool is intended to assist trail associations in creating maps for signs, races and promotional material. Print maps generated from Trailforks can not be used for digital resale for profit. Print maps generated from Trailforks can not be used for digital resale to make money. We do allow use of Trailforks maps in printed media if Trailforks credit is displayed and you make a request with us. Otherwise this feature is for personal use and to assist trail associations with generating maps and sign boards. The Trailforks basemap uses the font "DejaVu" for the trail labels and OSM road labels. You can download this free font here.